Curbside recycling collection is an every other week schedule and will continue to coincide with your rubbish collection day. This will provide more collections throughout the year and alleviate the occasional three week period of no recycling collection that occurred with the former schedule. Please put your recyclable items in a separate location away from your refuse. We recommend you put your recyclable items on one side of your driveway at the curb and put your refuse on the other side. Two distinct locations for these items will avoid missed collections and ensure efficient service. Place your recyclables and refuse at the curb line or edge of shoulder. Items not at curb side or at the edge of the roadway will not be collected. Place your refuse and recyclables curbside by 7:30 a.m. on collection day - some days we have extra crews or reverse the routes so please have your material out early. Please call the Service Department at 440-526-1384 with questions regarding the recycling schedule. If your recycling day falls on a holiday, recycling will be held on the following work day along with your regular rubbish pick-up. Blue plastic bags are reserved exclusively for recycling and may not be removed when used for rubbish. Please place blue bags, cardboard and newspaper at least six feet away from rubbish on scheduled recycling collection days. 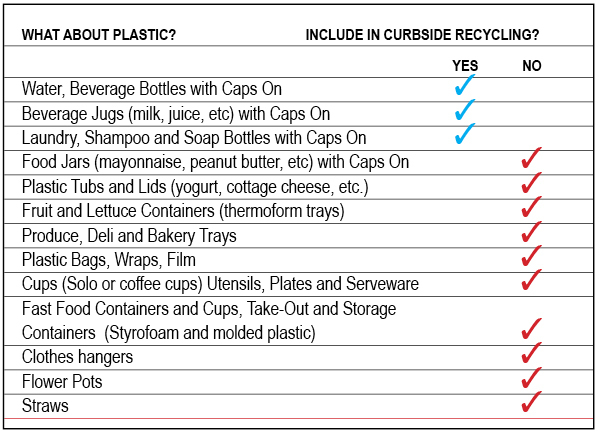 Combine only these 5 CORE items in your Curbside Recycling. Empty, Rinse, Dry and Replace Caps for CANS, CARTONS, GLASS BOTTLES and JARS, or PLASTIC BOTTLES and JUGS. These 5 CORE items can be combined into one common blue bag. Use large 13 or 30 gallon size blue bags available at your local grocery store. Continue to use small blue check-out grocery bags or brown grocery bags for newspapers and magazine. Cuyahoga County is encouraging all residents to not use blue plastic bags and use a container or can no larger than 35 gal. to recycle these items. A blue plastic bag can be tied to the handle to indicate recycling. As of yet, the City of Brecksville is not enforcing this, you may continue to use blue plastic bags. Place Recyclables, broken down and bundled corrugated cardboard and newspaper at least six feet away from rubbish on scheduled Recycling Collection Days. Saturdays from 8 am - noon. Contact charitable organizations to donate these items. You can also drop off unwanted clothing and household goods and plastic bags at one of many donation drop boxes located in retail parking lots throughout Cuyahoga County. CONSTRUCTION MATERIAL – Materials include lumber, drywall, brick concrete, metals, plaster, windows, roofing materials, plumbing fixtures, electrical wiring, heating equipment, and insulation. These items can be donated to organizations such as Habitat for Humanity. The Brecksville Service Department does not pick-up construction debris. SCRAP METALS and APPLIANCES Call the Service Department to schedule a Friday pick-up. All hazardous materials must be clearly marked before being accepted by the Service Department. City employees must know what chemicals they are handling and how to safely dispose of them. Medical waste such as syringes must be put in a heavy plastic carton with a lid, taped closed and clearly marked on the outside of the carton “Medical Waste” and placed with your rubbish. Fluorescent Bulbs cannot be accepted by the Service Department. Please check the website for updated information on how to dispose of them. Why do plastics have numbers inside recycling symbols if they’re not recyclable? The numbers on plastic containers are resin codes used by the plastics industry to identify the type of chemicals used to make the container. The codes do not always mean that the item is recyclable. Instead of looking at the numbers, look at the shape. If it’s shaped like a bottle or jug with a neck that is narrower than the body, it can go in your recycling. Cuyahoga County is encouraging that these items be loose in a can no larger than 35 gal. Tie a blue bag on the handle to indicate recycling. As of yet, the City of Brecksville is not enforcing this. Newspaper & Magazines - Newspapers, magazines, and junk mail can be combined and tied into bundles or place in brown paper grocery bags or blue plastic bag. Landfill Items - Styrofoam containers, Plastic cups, ceramic dishes and cups, hoses...etc. are items that should be put in your regular trash. These items are not recyclable. Propane Tanks – are accepted with curbside recycling or can be dropped off at the Service Department on Saturdays from 8 am - noon. Shred Your Documents - The City offers a safe and secure shredding service for residents in the following months of May and September.